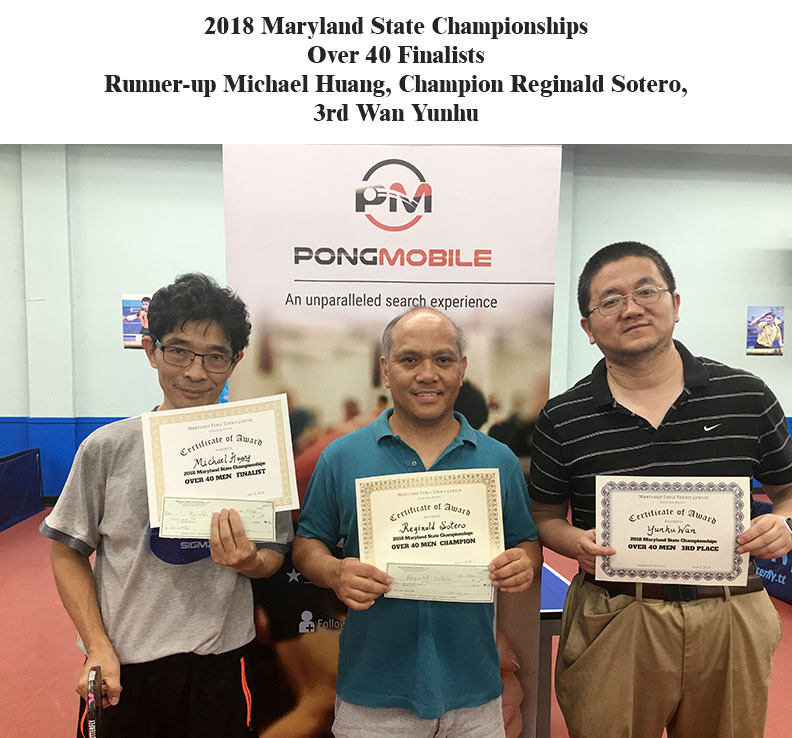 Despite pouring rain much of the weekend, 98 players took part in the third annual Maryland State Championships, a 3-star event held at the Maryland Table Tennis Center. 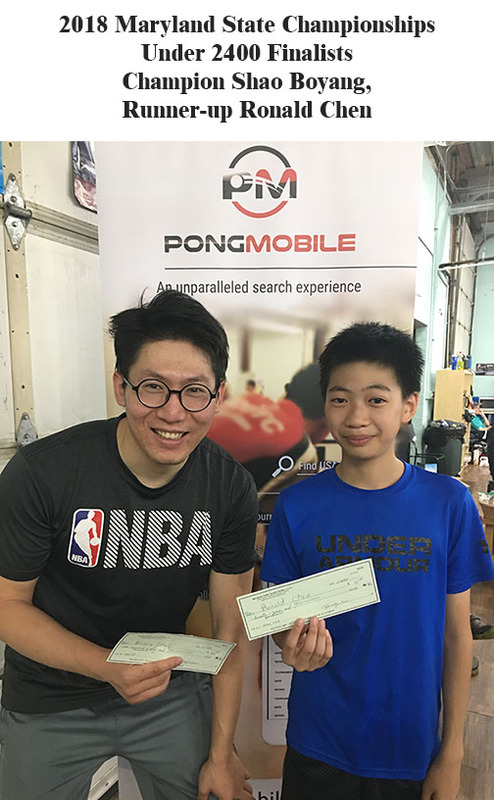 There were 18 events with $3500 in cash and prizes, sponsored by HW Global Foundation (which also sponsors the local junior program), PongMobile, and Butterfly. Lidney Castro, a former member of the Brazil National Team now living in Maryland, was seeded "only" third in Men's Singles at 2489. But he knocked off top-seeded Jeffrey Zeng in the semifinals (4,-11,-5,6,6,8), and chopper/looper Wang Qingliang (the 2012 U.S. Open Men's Singles semifinalist) in the final, 9,5,12. (Lidney also won Open Doubles with Martin Jezo, the other Men's semifinalist. 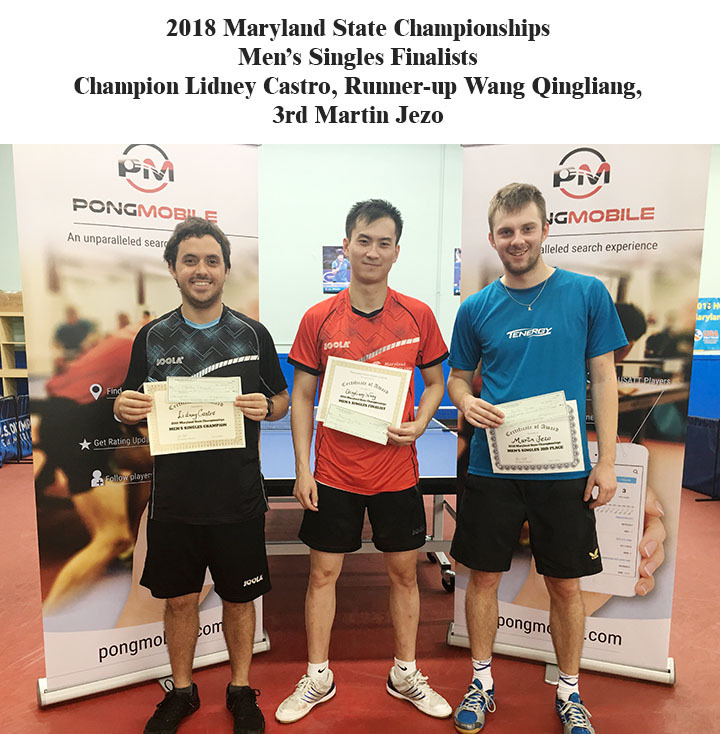 So Lidney Castro is the 2018 Maryland State Men's Singles Champion. The Men's Final was spectacular - rarely do you get to see points that alternate between looper vs. chopper, and counterlooping, with many points combining both. Here is the Point of the Tournament (55 sec), from the Men's Singles final! Lidney's a two-sport star. He was a professional soccer player, playing both regular and "futsal" (indoor soccer) for Santos FC, one of the biggest Brazilian soccer clubs in Brazil, until he was 19. (Maybe he should try out headis, which combines the two sports - here's video (36 sec)! Now he focuses on table tennis. Lidney said, "I think I've improved from the tournaments I played recently. I need to play more tournaments and matches to feel confident about my game. Last week I played well at the America's Team Championships but not enough to win close matches. However, that tournament helped me to get into the match/game mentality that I need to be able to play my best. The final match in Open Doubles was really close and Martin and I were behind 6-9 in the last game and we got a time out, after the time out we put everything we could and we manage to win the match. Luckily I got a really good partner who helped our doubles to make great shots in deciding points of the game. For the Men's Singles event I had a tough match in the semis with Jeffrey and I had to keep myself focused to win the important points. In the final I got more confident and I was definitely in the zone and even with Wang Qingliang playing really well, I knew I had to play more aggressively to be able to win. Luckily I didn't make a lot of mistakes and managed to win 3-0. The most difficult part to play this tournament is the fact that I have to play against the guys I really like, but I'm happy because I could play my best today." Women's Singles came down to a three-way tie. In the final group of four, unrated Iva Laginja defeated second-seeded Si Cheong - the steady long-pips blocker - at 7,7,9. Then Si upset top-seeded Caroline Kajihara at 7,6,-6,5. In the final match, if Iva wins against Caroline, she's the state champion. But the problem for Caroline is that she lost to Si 1-3, while Iva beat Si 3-0. (Si's record among the three is 3-4, and so she can't win.) If Caroline wins 3-1, among the three she finishes 4-4, while Iva is 4-3, and so wins. So Caroline needs to win 3-0 to win. (Then she'd be 4-3 to Iva's 3-3.) 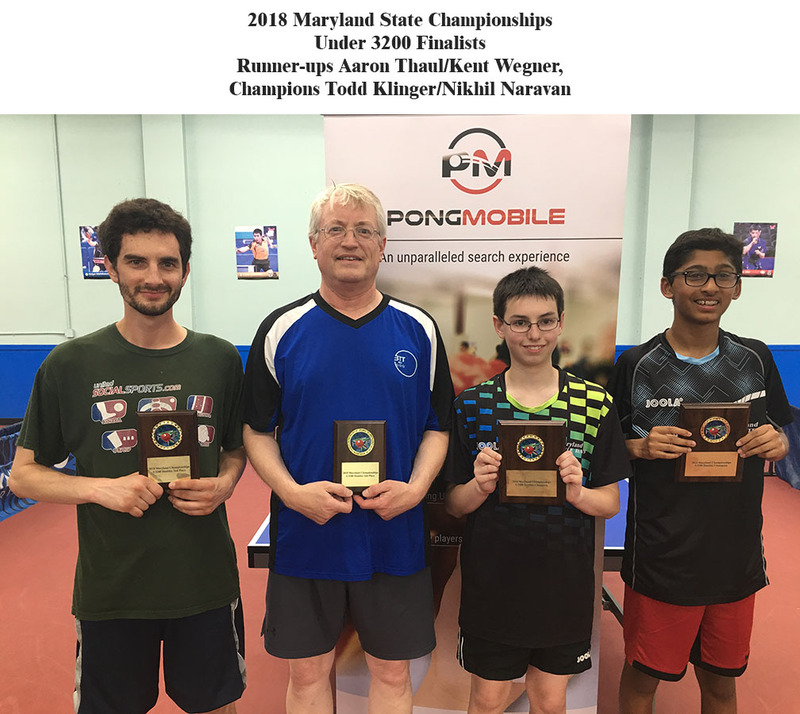 Carline wins the match, but alas for her, she wins at 8,-11,-6,4,7 - and as soon as Iva Laginja won that second game at 13-11, she clinched the title and is the 2018 Maryland State Women's Singles Champion. Iva was originally from Austria and used to train nearly full-time and compete in tournaments. She stopped training after college and is now an astronomer, who moved to Baltimore eight months ago. One thing that stood out this tournament were some of the crazy scores. 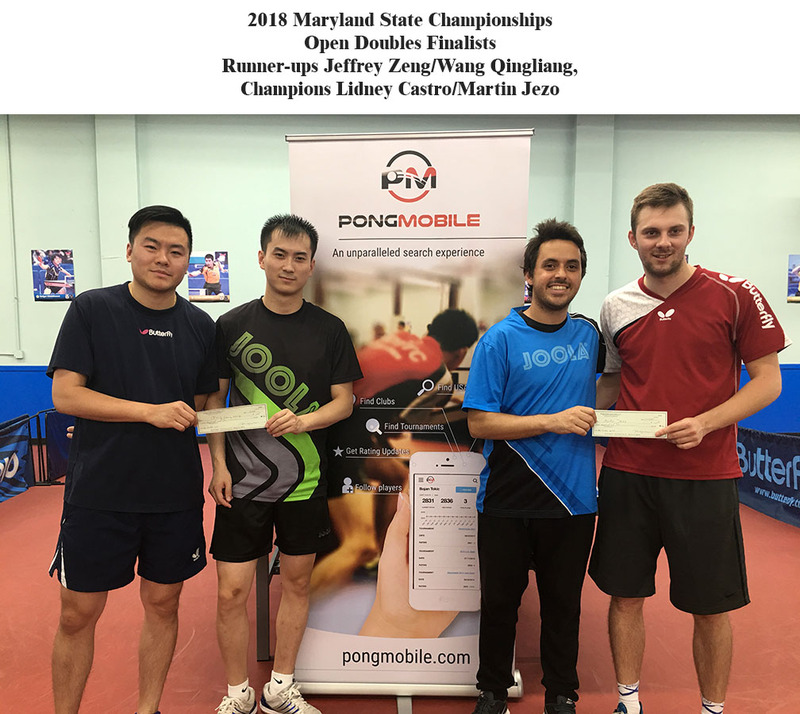 That Open Doubles Final where Lidney Castro/Martin Jezo won over Jeffrey Zeng/Wang Qingliang? 9,-9,9,-9,9! Jeffrey was in another weird score he'd rather forget, losing the playoff for third in Men's Singles to Martin at -2,-5,11,9,8. 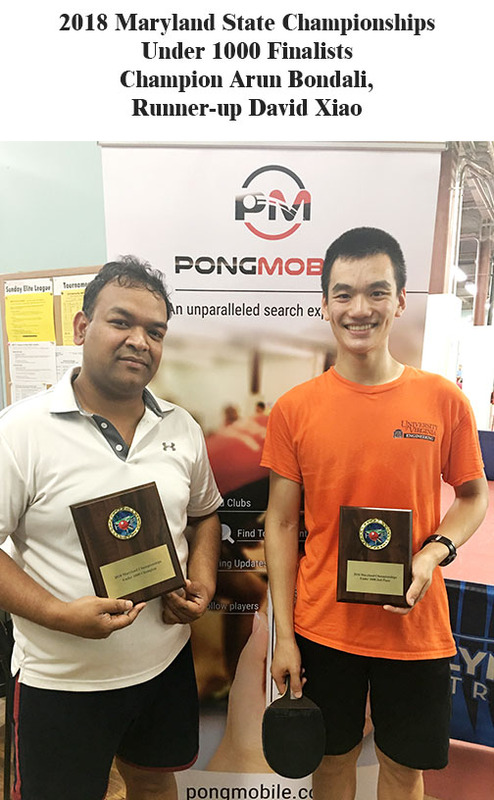 Then there was the playoff for third in Under 2400, where William Huang defeated Luis Enrique Serrano Torres, 10,-18,-9,6,16! 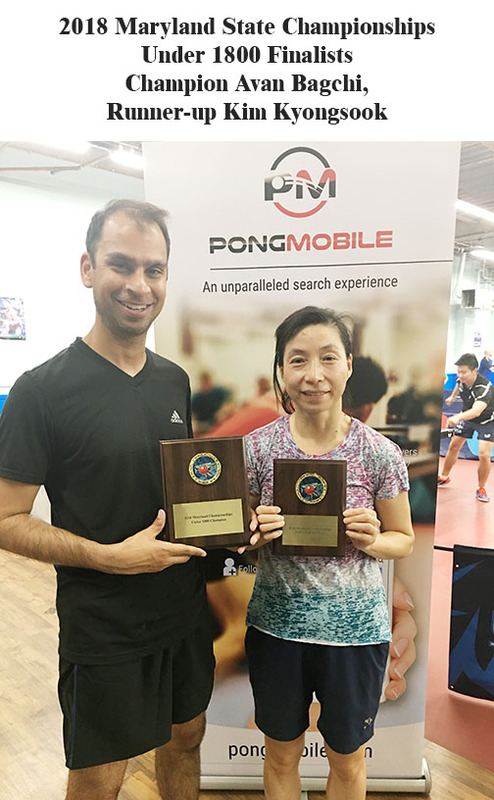 Another wild score and result was the final of Under 4000 Doubles, where Jie You (a professional coach from Atlanta, Georgia, now coaching in NYC) and Tianzuo Huang won over Stanley Hsu (#1 under 10 in the U.S. and top-seeded in Under 10 at the upcoming USA Nationals) and Mu Du (#4 under 10, and third seed in the upcoming USA Nationals), -13,7,-5,7,13! Rarely have you seen players consult between points as much as these two teams - the kids were as tactically minded as their elders, and almost won. And there was Nikhil Naravan's match - see next paragraph. A number of juniors did very well this tournament. 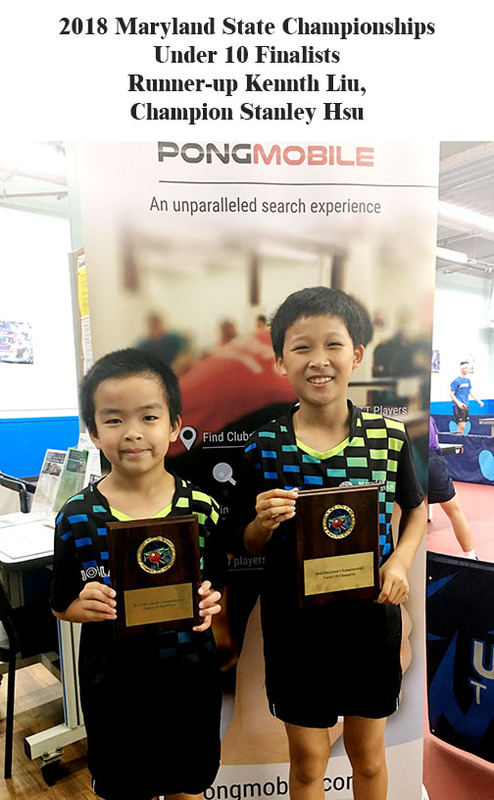 Stanley Hsu, 9, won Under 10 and Under 12, was second in Under 15 and Under 4000 Doubles, and third in Under 2100. 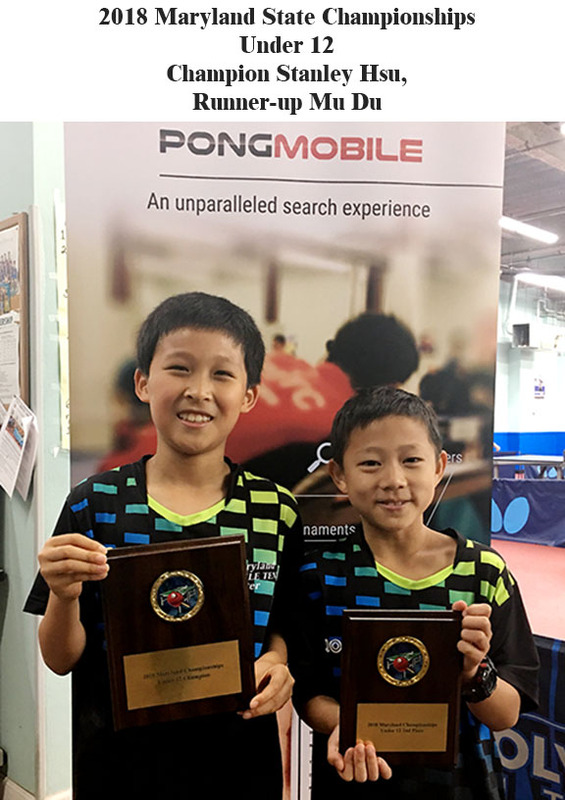 Ronald Chen, 13, won Under 15 and was second in Under 2400, while his brother, Spencer, who turned 16 on Saturday (and has been rated as high as 2233), won Under 2100. Mu Du got second in Under 12 and Under 4000 Doubles. 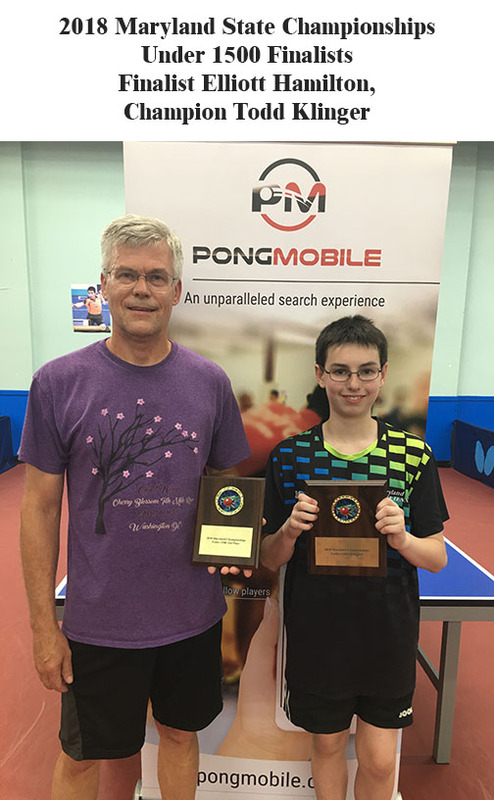 Todd Klinger, 13, won Under 1500 and Under 3200 Doubles with Nikhil Naravan, also 13. Nikhil was in the semifinals of Under 1800, where he led 2-0 before losing an excruciating -7,-8,8,6,14 match to Avan Bagchi, who would win the final 3-0. 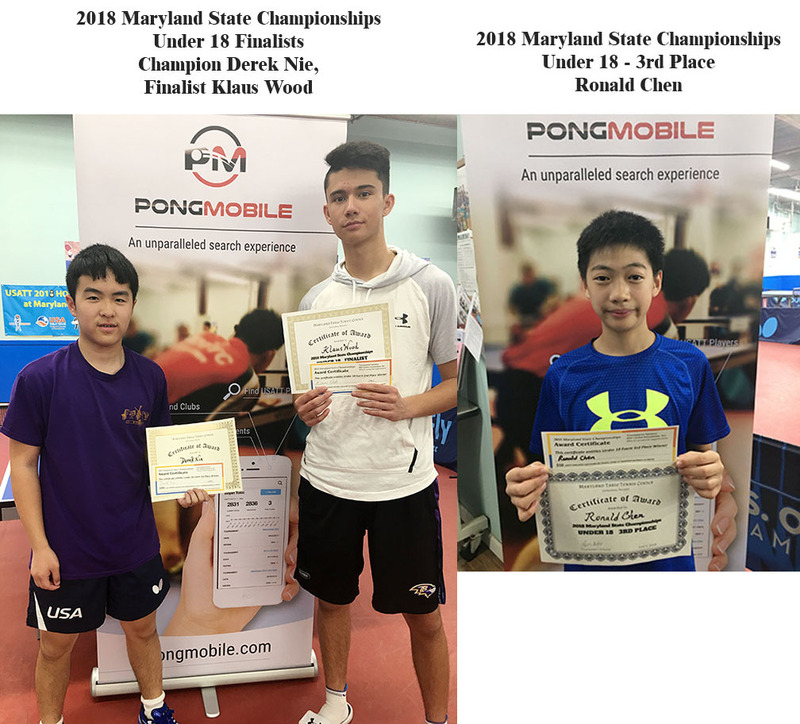 One piece of big news - Derek Nie, 17, who was on the USA National Cadet Team a few years ago but then stopped playing for nearly two years, is back in training, and won Under 18 over Klaus Wood, 13,7,2. He'll be playing in the upcoming USA Nationals. It wasn't just juniors doing well. Lixin Lang won Over 55 without losing a game - and would have been top seed in Over 40 if he'd entered. He also made the final of Under 2100. More importantly, he dominated on the mini-table, taking on all challengers, mostly juniors, in on-and-off games throughout the day. 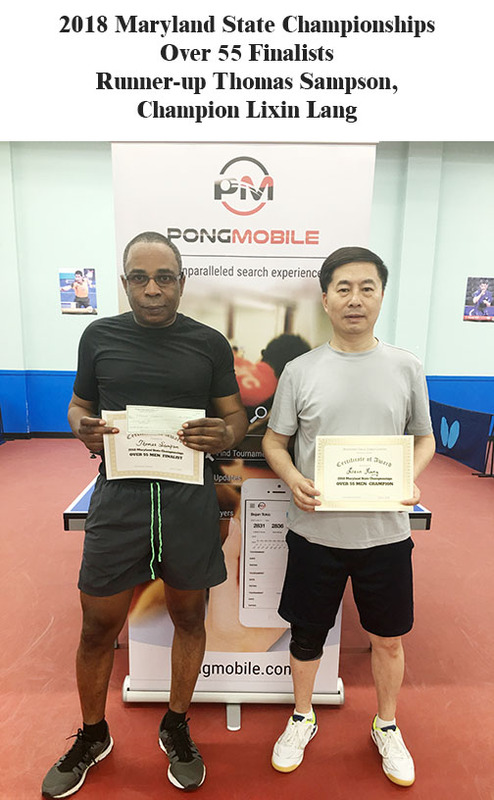 A great thanks goes to Mossa Barandao of PongMobile, who helped run the tournament and sets up a station so players can easily look up their ratings and ratings histories via PongMobile. (The station is always surrounded by players.) Also a thanks to the juniors who perpetually helped out in various ways, in particular Kurtus Hsu and Jackson Beaver, who often did data entry and other tasks. Thanks goes to referee Paul Kovac and umpires Stephen Yeh and Vahid Khajoee. And a great thanks to the 98 players in the tournament! Complete results are available at Omnipong. Here is a summary – click on event links to see pictures of the finalists! Men's Singles - Final: Lidney Castro d. Wang Qingliang, 9,5,12; SF: Castro d. Jeffrey Zeng, 4,-11,-5,6,6,8; Wang d. Martin Jezo, 10,4,9,7; 3/4: Jezo d. Zeng, -2,-5,11,9,8; QF: Zeng d. Shao Boyang, 3,5,3; Castro d. Richard Lee, 9,9,-9,8; Wang d. Luis Enrique Serrano Torres, 5,11,7; Jezo d. Derek Nie, 4,4,3. 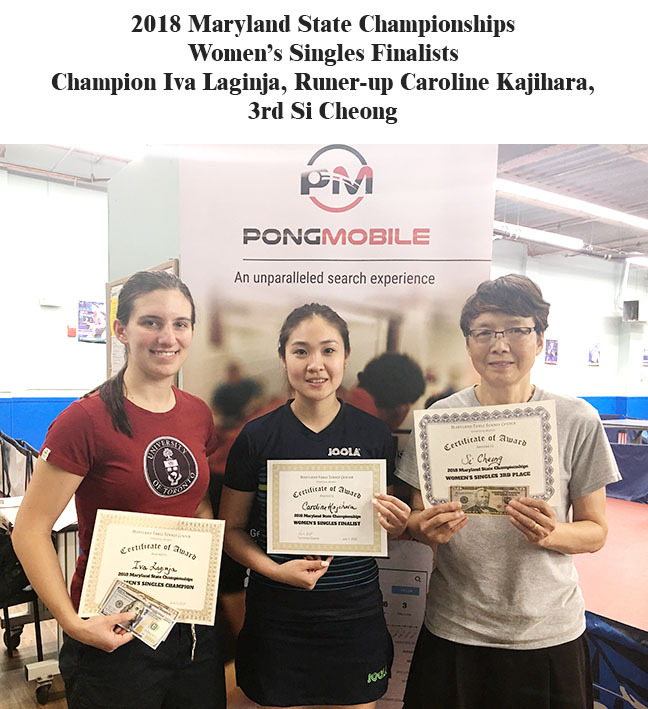 Women's Singles - Final RR: 1st Iva Laginja, 2-1 (d. Si Cheong 3-0; d. Jenny Sirisamphan 3-0); 2nd Caroline Kajihara 2-1, (d. Jenny Sirisamphan 3-0; d. Si Cheong 3-0); 3rd Si Cheong, 1-2 (d. Jenny Sirisamphan 3-0); 4th Jenny Sirisamphan, 0-3. Open Doubles - Final: Martin Jezo/Lidney Castro d. Jeffrey Zeng/Wang Qingliang, 9,-9,9,-9,9. 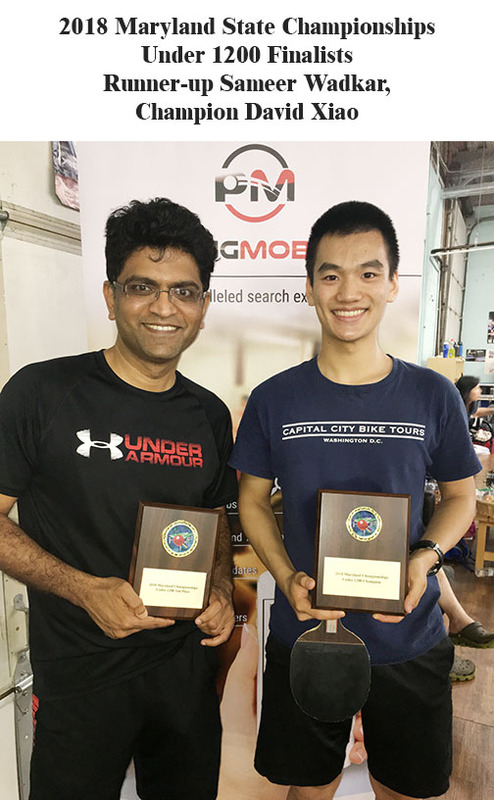 Over 40 - Final: Reginald Sotero d. Michael Huang, 8,7,-9,-9,3; SF: Sotero d. Wan Yunhu, 5,8,5; Huang d. Sameer Wadkar, 3,3,10; 3/4: Wan d. Wadkar, 10,8,-6,7. Over 55 - Final: Lixin Lang d. Thomas Sampson, 10,5,9; SF: Lang d. Xinsheng Michael Huang, 14,6,4; Sampson d. Chris Buckley, 5,2,7; 3/4: Huang d. Buckley, -9,8,9,8. 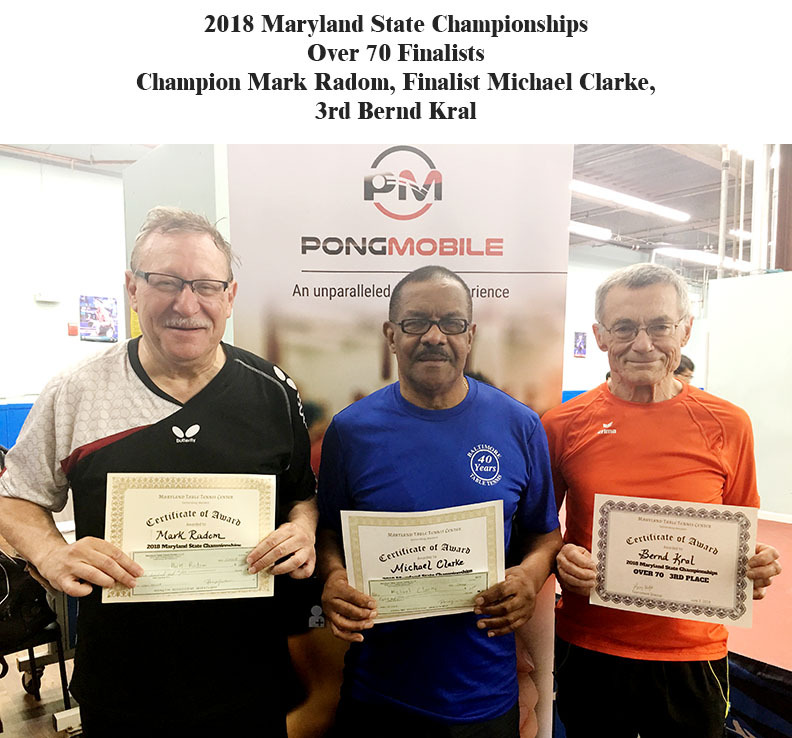 Over 70 - Final: Mark Radom d. Michael Clarke, -8,3,6,7; SF: Radom d. Bernd Kral, 4,3,8; Clarke d. Pelle Deinoff, 10,9,8; 3/4: Kral d. Deinoff, 4,6,3. Under 18 - Final: Derek Nie d. Klaus Wood, 13,7,2; SF: Nie d. Ronald Chen, 7,7,-9,7; Wood d. William Huang, 8,7,6; 3/4: Chen d. William Huang, -9,7,9,-8,8. 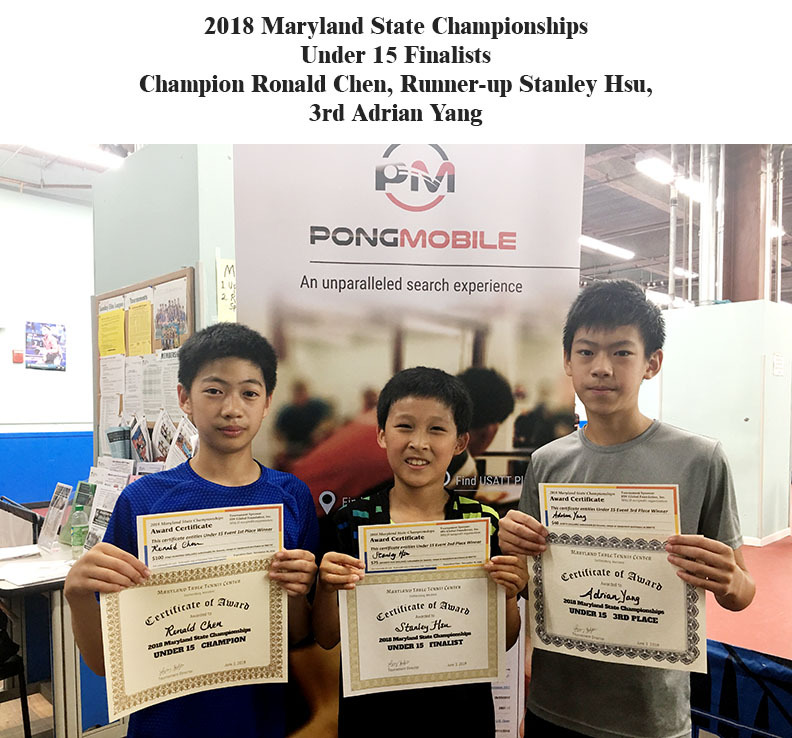 Under 15 - Final: Ronald Chen d. Stanley Hsu, -9,9,6,14; SF: Chen d. Adrian Yang, 9,7,6; Hsu d. Jackson Beaver, 8,5,3; 3/4: Yang d. Beaver, -9,-11,9,7,8. Under 12 - Final RR: 1st. Stanley Hsu, 3-0; 2nd Mu Du, 2-1; 3rd James Zhang, 1-2; 4th Kay O'Hara, 0-3. Under 10 - Final: Stanley Hsu d. Kenneth Liu, 4,1,5. Under 2400 - Final: Shao Boyang d. Ronald Chen, 8,8,6; SF: Shao d. William Huang, 10,9,-8,3; Chen d. Luis Enrique Serrano Torres, 5,-8,7,4; 3/4: Huang d. Serrano Torres, 10,-18,-9,6,16; QF: Shao d. Abbas Paryavi, 11,8,8; Huang d. William Xu, 9,6,6; Chen d. Louis Levene, 7,5,2; Serrano Torres d. Aron Zhang, 11,4,9. 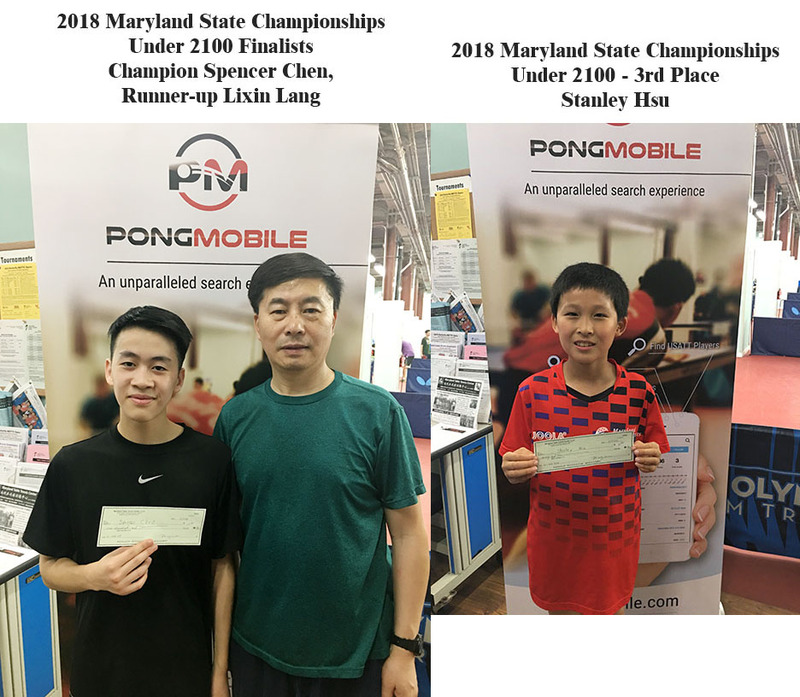 Under 2100 - Final: Spencer Chen d. Lixin Lang, 7,5,7; SF: Chen d. Adrian Yang, 4,2,5; Lang d. Stanley Hsu, 4,7,4; 3/4: Hsu d. Yang, 5,4,10. Under 1800 - Final: Avan Bagchi d. Kim Kyongsook, 6,8,8; SF: Bagchi d. Nikhil Narayan, -7,-8,8,6,14; Kim d. Aaron Thaul, 8,8,-8,6. Under 1500 - Final: Todd Klinger d. Elliott Hamilton, -10,6,3,-8,8; SF: Klinger d. John R. Miller, 8,7,7; Hamilton d. Jason Mowery, 5,6,8. Under 1200 - Final: David Xiao d. Sameer Wadkar, 7,9,9; SF: Xiao d. Cyndy Meng, 12,7,-9,4; Wadkar d. William Roberts, -6,9,5,9. Under 1000 - Final: Arun Bondali d. David Xiao, 6,11,-8,5; SF: A. Bondali d. Param Bondali, 4,7,-8,9; Xiao d. Kelvin Zhou, 11,-7,1,2. 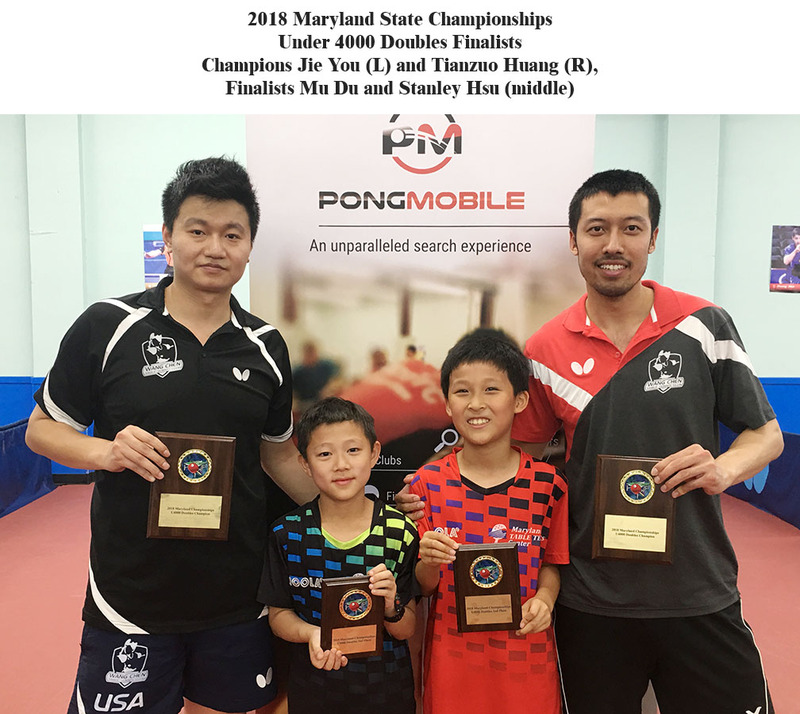 Under 4000 Doubles - Final: Jie You/Tianzuo Huang d. Stanley Hsu/Mu Du, -13,7,-5,7,13. Under 3200 Doubles - Final: Todd Klinger/Nikhil Naravan d. Kent Wegner/Aaron Thaul, 7,11,11.